Happy Saturday to you all! I hope you are enjoying your weekend so far! 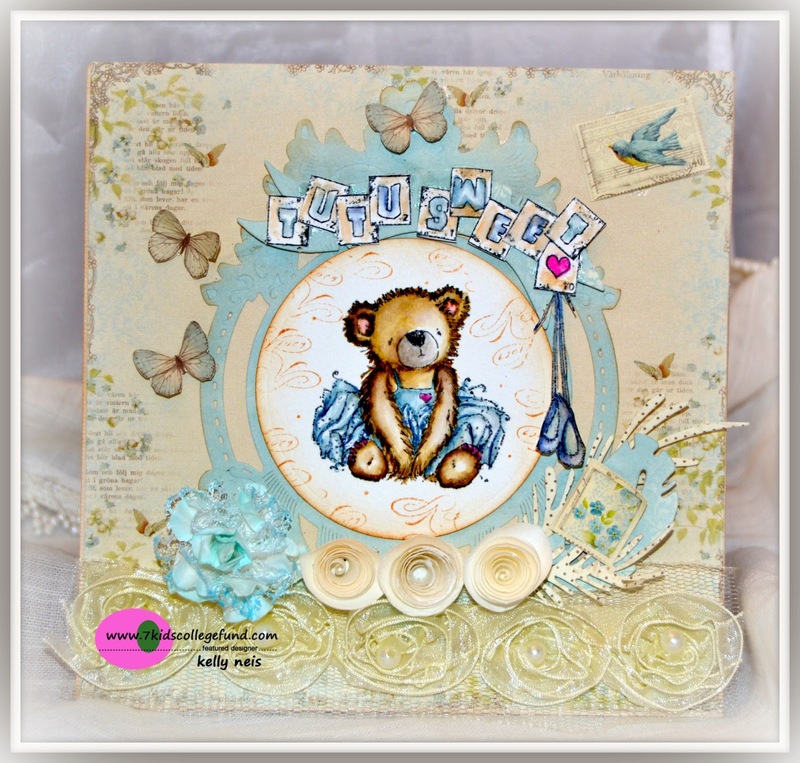 The sweet bear is mounted on a Spellbinders Gold Majesty circle I cut from the Pion paper in blue. I also cut the Magnolia doohickey dies, feathers and sprawling spruce. I added the Pion butterflies and little tags to match. 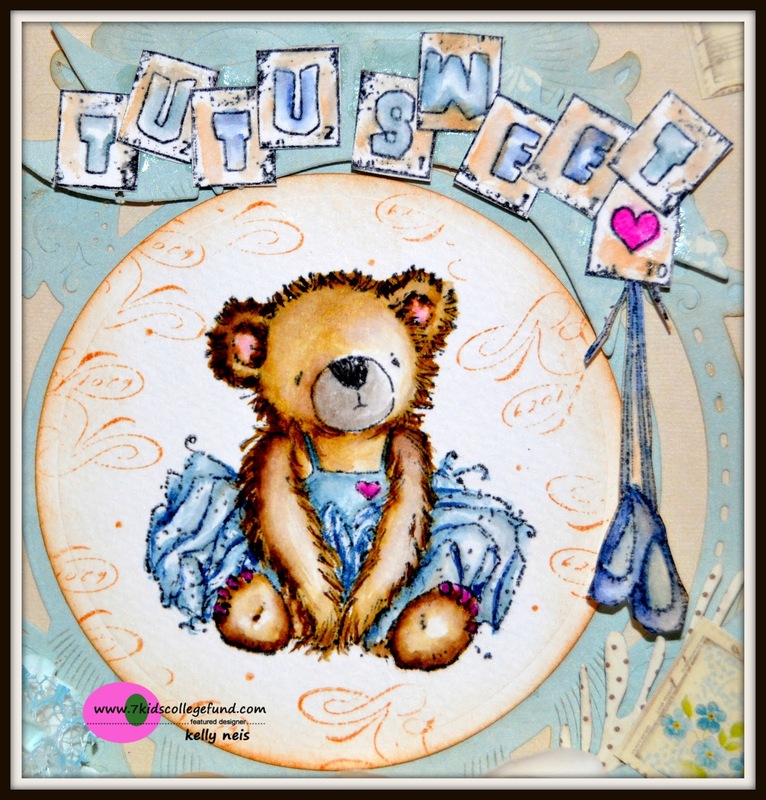 She is colored in Distressed Inks ad then I used a word stamp from Magnolia to add the scrolls to the background. Above I used the Little Darlings word set "Use your Words" and spelled out Tutu Sweet as that is the words that are included with the stamp set, no need to change it. Below you can see a bit of the ballet slippers, they are also part of the stamp set. I used a rose ribbon across the bottom and then a floral from Magnolia, 3 Kort and Godt rolled roses and then the Magnolia Doohickey die cuts. Currently 7 Kids College Fund has a challenge up ANYTHING GOES! The prize is a awesome gift certificate to the 7 Kids College Fund Store. Hope to see you there!! Kelly this is just so cute and adorable. Love the beautiful textures and how you did the lettering. Love this Kelly... so sweet, girlie and cute, cute, cute! Beautifully done Kelly - your coloring is fantastic - you are indeed an artist! Isn't Mo Manning the best!!!! Wonderful card Kelly! Oh my goodness this is too too sweet!!! 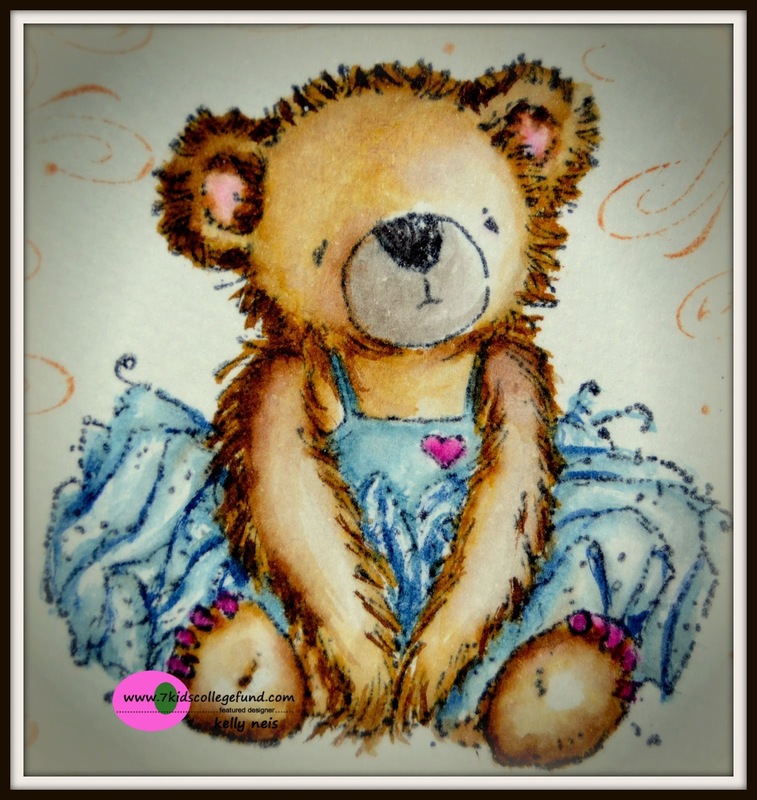 What a lovely teddy with beautiful embellishments. Yes the Pion papers are so special and also the dies. Heck it's all so special as usual!!! Lovely card Kelly with beautiful embellishments. Oh so cuuuuuuuuute ! So adorable image oh and what a fabulous colouring ! Your card is very pretty ! This is gorgeous Kelly and the coloring on that Mo bear is sensational. The folds and details are so defined. This is fabulous. Oh girl, you did a great job coloring the fur.....that's a challenge for me!!!!! The image is so stinkin' cute and, yes, everything looks great on Pion papers!!! Oh, Kelly - I can completely see why you fell in love with Mo's bear, she's utterly adorable! And the light dancing on her fur that you've achieved with your colouring is remarkable - and beautiful. A lovely card, making great use of those yummy Pion papers. Here to do my usual catching up... very much looking forward to seeing what you've been up to!! Awwww Kelly! Yes, I do agree that Pion papers are soooo beautiful! Makes everything look so soft and delicate! What a gorgeous color combo and omgosh .. you cut out the butterflies?! Wowwwww! I love it! This is BEAUTIFUL Kelly!! !